This chapter is the first of this book’s analytical chapters. It is interested in non-fiction films that engage with, and more importantly appear to interrogate and manipulate, archive footage. It explores what emerges when celluloid archive footage and video or digital are juxtaposed together in Free Fall (Péter Forgács, 1996) and A Film Unfinished (Yael Hersonski, 2010) respectively. 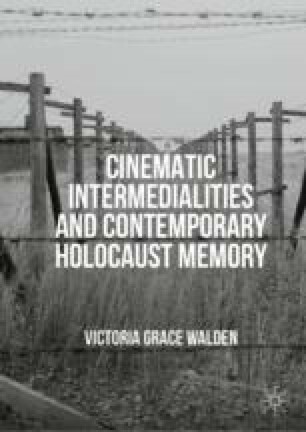 It considers what happens when past and contemporary media and images come into contact, and how this might encourage the production of Holocaust memory. This chapter interrogates theories of cinematic realism. Resisting suggestions that film can present the reality of the past, it turns instead to the real of the viewing experience to consider how its assemblage nature creates a collaborative, productive environment that enables producers, spectator, film, media technologies, individuals from the past captured onscreen, and archive materials to perpetuate memory of the Holocaust. My discussion of A Film Unfinished particularly highlights the archaeological nature of the film and how its desire to disrupt any previous meaning related to perpetrator-commissioned images can be a powerful tool for memory.